A financial exchange turns into quiet passion as a scarred heiress and a down-at-the-heels aristocrat fall in love after their wedding. 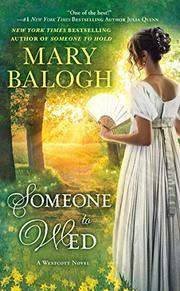 In this third novel in the Westcott family series, Balogh (Someone to Hold, 2017, etc.) employs the classic “marriage of convenience” trope but without the rancorous couple often found in such plots. Wren Heyden has led the life of a recluse, fearing people’s reactions to a facial blemish. Raised by kindly distant relatives, she has shunned other intimacy but knows she must act if she is to have any family in the future. The target of her ambitious proposal is Alexander Westcott, the new Earl of Riverdale, who has unexpectedly inherited the decrepit neighboring estate. Alexander is taken aback by her offer but torn between offense and a nagging sense that Wren has hidden depths. This instinct, and the rationale that her money from a prosperous business could restore his holdings, convinces him to wed the woman who warns him she is a bad bet. As their courtship and honeymoon unfold, Wren sheds her veils to trust the growing love of her thoughtful spouse. In turn, Alexander is outraged when he learns who forced a fearful mask on his gentle wife but understands that she needs support in confronting her demons, not rescuing. Balogh constructs detailed portraits of both characters, but some members of Wren’s family seem like caricatures, and there’s too much screen time given to the many Westcotts seen in previous books, slowing the pace of the action to a crawl. The back story recaps also feel excessive though done in service of the idea that marriages are not just between two people. In the author’s familiar meditative style, the novel demonstrates how family ties can be forged by patient and persistent devotion in marriage.